Goalkeeper blunder continues run of poor results against rivals. 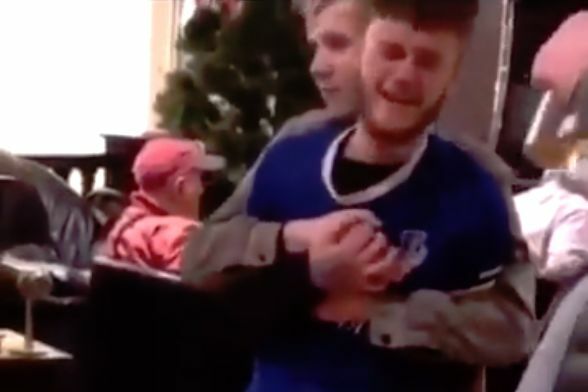 A sad-looking man in an Everton shirt had to be consoled after a misjudgement by goalkeeper Jordan Pickford led to late Liverpool goal in a 1-0 home win at Anfield on Sunday evening. The game looked to be heading for a draw before the 96th-minute winner devastated the visiting fans. Everton have not won against their rivals in 18 attempts and are yet to win at the nearby stadium this century. One supporter, who looked to have been watching the match in a pub, seemed to take the defeat particularly to heart. In a video that appears to have been recorded from behind the bar in the drinking establishment, he can be seen being hugged by another man while looking distressed.